Via eyeteeth.org, I learned of frieze magazine’s review of Design Like you Give a Damn, edited by Cameron Sinclair and Kate Stohr, founders of Architecture for Humanity. I was interested in the review, written by Irene Cheng, because Paul Schmelzer and I interviewed Cameron Sinclair recently to learn about AFH first-hand. After meeting Sinclair and visiting with him for two hours or so, I was surprised by the review. Architecture for Humanity tries to connect design talent with design problems, usually in areas in great need. Such a connection did not exist as Sinclair finished up his architecture training and embarked into the workaday world. The reviewer critically asks the question “are architecture and design really capable of ‘solving’ global, social and humanitarian crises? Or are such issues too complex to be fixed with simply another lighter, cheaper, emergency tent?” As an architect, I take this as another attempt to marginalize architects and what they do, and I chafe at it. Because it implies that architects design in a vacuum, ignorant of the people and the realities for which they are designing. Can architects design “emergency tents”? Sure, we can. But we are trained well beyond that to be integrative and collaborative thinkers, solving multiple problems at once, bringing together divergent criteria and differing opinions into a cohesive, responsive, and beautiful whole. Most of the architectural design process is exactly that: process. What the world sees (and reviews in books) is product and personality. If all you see is the product of architecture, you are missing the point. The same pitfall presents itself when you judge a person by an introduction. CS: We do have a community design process that starts immediately. There are things communities really want to have happen in the reconstruction phase: They want to be employed. I joke about this: for the cost of one US consultant, I can hire 600 villagers. By creating a small economic engine in a community, you’re actually helping the economic stability so it actually becomes sustainable. And the second thing is, we design with the community and not for it. So that means they become empowered in the design process and that they infuse not only their needs, but they’re actually part of that design. They actually draw out that design with us. They develop models with us, and eventually, through skills training, they build the buildings with us. And we make a rule not to have any signage, because the idea is that, when the building is up, they’ll name it. That level of ownership, that transferal of ownership is important. Otherwise, it’s a hand-to-mouth solution. Paul: Who is the “us” when you say they work with “us”? Is it you and your wife, or is it more like your design competition architects? CS: When we’re working in a natural disaster, we never do competitions. We do design competitions for systemic issues—homelessness, developing mobile health clinics, tackling HIV/AIDS in Africa—but we collaborate with a number of different teams. The entire team that’s working within a project not only consists of architects, but those who have expertise with a specific issue. There’s no such thing as utopia. You can’t have one solution. It’s a very unique situation. For instance, we have engineers, we have soil engineers, we have landscapers, we have governmental officials, we have community leaders, we have community members, and in certain circumstances, we have an issue with elephant migration patterns in Sri Lanka. So we have an expert on elephant migration. It’s something a lot of engineers didn’t even think about. They found an empty plot of land and they asked the government, “Well, there’s this empty plot of land, can we just build our villages there?” And the government didn’t really know, and they said, “Sure, go right ahead.” And they never asked any of the community why this land is empty. It was on a migrational route for elephants, and what happens is, when elephants get really tired, they lean against trees and fall asleep. They lean on poorly built houses and then the houses collapse. Peter: I never would’ve thought of that. CS: We never would’ve thought of it either. But it was a local with expertise in wildlife who said, you know, you’re disturbing the ecosystem here. Paul: How did it come to be that you had a relationship with a person who could tell you that? CS: Just through meeting with community members and spending a lot of time talking with them. You learn more in those late nights over a couple of beers. When we have a community meeting, it’s not like it’s 10 a.m. Monday morning and everyone’s wearing a tie. It could be rice and curry at 10 o’clock at night with a couple of beers, and it could be 100 people in a basement. Peter: So is the whole project team, then, on-site, for a charrette, a weeklong charrette? CS: They’re there for maybe upwards of two years. So, the question raised: are architecture and design really capable of ‘solving’ global, social and humanitarian crises? Sinclair’s comments suggest that the reviewer’s separationist view of architecture is inaccurate, and that the efforts of Architecture for Humanity do work toward solving social and humanitarian crises. For example, is providing meaningful work to local community members an architectural or design problem? No. 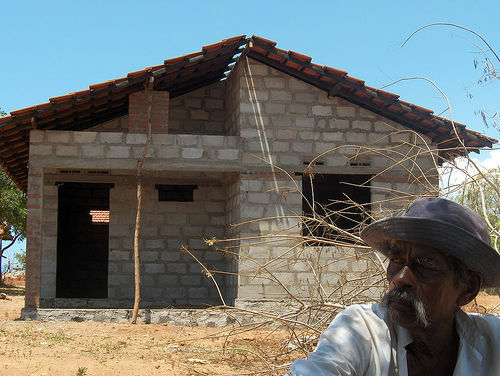 But designing for and with the local people, using techniques and technologies that they can build themselves, to resist natural disasters in the future certainly is. And, by intent, it strengthens the local community on social, economic, and aesthetic levels while providing for basic needs. The reviewer goes on to lambaste AFH for backing away from a project due to limited resources rather than “any qualms about providing a humanitarian palliative to a military action of dubious ethical status.” I chuckle. For any organization, or those suffering from the results of military action, the “Can we do it” question has got to proceed the “Should we do it”. What point is there arguing ethics relative to a project that can’t be realized? I can barely believe these words hit the blogosphere, given the politics that led up to the unpreparedness before and the mismanagement after the disaster in the Gulf Coast. We’ve been relying on politics, and they are simply not up to the task. How many disasters must people live and die through before we look for a better paradigm? There are two things we adhere to. One is that quiet change matters. So we don’t make a big deal out of it. And also, small projects can have really big impacts. We focus on very low-cost, small projects, not because we want to help one family, but we want to set a base to change policy. So if we can do a project that’s within budget, adheres to current guidelines, but challenges one or two of them—we build the project—then we can go to the government or to the local governing body and say, “Look, if you change your policy, you could affect the lives of millions of people. And here’s a project where we’ve solved your problem.” So we walk into the office with a solution, not a problem. So, AFH has rescripted the architect from designing emergency shelters into a leader. A leader whose collaborative, technical, and creative skills inform politics and empower communities to improve themselves. That’s of much more value than an stronger, cheaper emergency tent. Credits: The interview will appear in the forthcoming book, Land, Art: A Cultural Ecology Handbook, to be published this winter by the Royal Society of Arts’ Arts & Ecology program.